On the evening of Saturday, 12 August Pantastic Friday, the unthinkable happened! To the disbelief of the scores of the pan players assembled to perform and their faithful fan base, Panorama was postponed — supposedly because the stage had not been constructed in time!!?? How was this possible?! Panorama happens every year and is one of the official events of Carnival. Everyone is aware of the tremendous logistic effort, time and expense required to move a steel band so, unless there is a national emergency, these factors must be considered and notice given well ahead!! This year, again, the issue of the clash of Panorama with a party event hosted by a private promoter had surfaced. And, not only was the event being held on the same night but also at the same venue as Panorama, a practice which began in 2016. In 2016, pannists complained of the unholy haste with which their bands were hustled out of the area to make way for a ‘White’ party. They felt disrespected and were hurt. And it seemed that in 2017, they would not even be welcome at the stadium. Earlier on in the week, members of the general public had heard that the pannists were unhappy with a proposal by the Spicemas Corporation to move Panorama to the Tanteen Netball Court. However, on the Friday evening newscast, the public was advised that differences had been settled and that Panorama would be held at the official Carnival venue. And then, this fiasco!! This last-minute postponement of Panorama MUST NOT be taken lightly by the people of Grenada, whether or not involved in Carnival. This incident is just another symptom of an issue way beyond pan — a troubling trend in Grenada, supposedly in the interest of ‘progress and development,’ a capture of public spaces by private actors to the disadvantage, even exclusion and detriment of the ordinary citizen. The postponement of Panorama is NO DIFFERENT from attempts to arbitrarily relocate Camerhogne Park to accommodate foreign investors or identifying Quarantine Point for the location of a Blue Innovation Institute, identified as the mechanism to facilitate debt swap. There is NO RESPECT and no consideration of the rights of the ordinary citizen. Move out of the way in favour of ‘investors’ and ‘investment.’ For whose benefit? Whom did the postponement of Panorama benefit? Panorama is the premier pan event of the country, and everyone knows of the dedication, the effort and the hours put in by all involved. It is one of those events that display the best of Grenada. It also bridges the inter-generational gap and is a significant youth development investment since most bands are dominated by young people, most of whom are school students. What does this decision signal about the respect and value that the ‘authorities’ place on the investment and contribution of those in the pan movement? What happened to Panorama must not be seen in isolation of other incidents and happenings. It is useful for Grenadians to recall, that the Queen’s Park property before ‘the advent of progress was the people’s property. It was a GIFT to the people of St George’s for recreational purposes from one Ms D’Arbeau. It was one of the biggest and prettiest public recreational areas in the Caribbean. Politicians of successive administrations, in their deliberate judgement, without any input from the REAL OWNERS of the Queen’s Park property or competent technical advice, made decisions about the use of the space, putting up various built structures. Then during the period of 1997–2003, there was the construction of a cricket stadium and an athletic stadium. Before the advent of this ‘progress and development’, Queen’s Park boasted several football fields and a small pavilion where EVERYTHING of note happened — from national to local, from political to religious, cultural and sporting events. It accommodated ALL and sundry. Most events that took place in ‘the park’ were also significant income-generating opportunities for small vendors. Both stadia crumbled like a pack of cards during the passage of Hurricane Ivan in 2004 and were restored with the largesse of the People’s Republic of China — the cricket stadium in time for Cricket World Cup 2007 and the football and athletic stadium in February 2016. For whom were these facilities constructed? Whom were they intended to serve? How accessible and affordable are these facilities now? Are small vendors accommodated at events in the national stadium? While it has probably faded from the memories of most, it would do us well to recall that in 2002, Grenada floated a US$100 million bond at commercial rates to pay off its debt on the stadia, among other things. That US$100 million bond, external debt, is at the core of the Grenada debt situation for which we the people are all ‘sacrificing.’ This external debt has been restructured and Grenada has negotiated a ‘haircut’ with the bond holders. It is quite possible that it will finally be settled by a DEBT FOR NATURE SWAP. One may well be asking what is the point? What is the relationship between postponement of Panorama and the external debt? The point is we the people are still paying for the national stadium. The national stadium, a public facility, is the official venue of the finals of most Carnival events. Panorama, as an official Carnival event, therefore has FIRST right of use of that stadium. It only happens once a year, at the same time every year. Perhaps, it is useful here to note some of the ‘authorities’ future plans’ for the national stadium. At a Press Briefing of 27 April 2017 we the people were advised of an ‘excellent meeting’ held with the Minister of Finance of Qatar who would seriously consider sending a technical team to assist Grenada in creation of a ‘sports village,’ which would involve the reclamation of land from cruise ship [port] to Queen’s Park — expanding St George’s and creating space for offices, business buildings, more sporting activities. A look at the ‘Blue Growth Coastal Master Plan’ identifies plans for a national sports centre and sports village which ‘will include the existing National Stadium grounds as well as the adjacent hilltop land.’ The reclaimed land along the coast would provide ‘key water frontage for creating a comprehensive national sports complex’. The following have been identified: tennis pavilion, field house, aqua centre, offices, hilltop housing, resort hotel, practice field, special events ground.’ This is another example of the planned capture and privatisation of public space — national stadium and surrounding grounds, coastal area. For whom is this development? Who will be the REAL beneficiaries? The postponement of Panorama should be a REALITY CHECK — another symptom of that cavalier attitude of the ‘authorities’ towards we the people. This attitude did not start yesterday. But we did not pay attention. What else should we expect? How much more should we tolerate? Let us stand up for the right of Panorama at the National Stadium until an alternative location is mutually agreed! 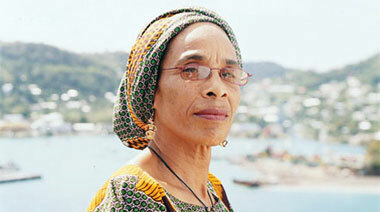 Standing up for Panorama is standing up for Grenada! We are not going to accept ‘DEVELOPMENT AT ANY COST’ ; IT HAS TO BE DEVELOPMENT THAT BENEFITS THE ‘RANK AND FILE’ / BORN AND BRED GRENADIANS. It is very obvious that Quarantine Point is being turned into an exclusive area for the few privileged Grenadians and well off visitors and a stop must be put to it. Last Sunday the ROTARY CLUB of Grenada was hosting a pre Carnival party which only few Grenadians would have been able to attend at the high cost of over $100pp….Is this what our gov’t is doing with our heritage and should we allow them to manage our affairs? I say NO, NO, NO LET US MAKE THE BIG CHANGE AS SOON AS WE HAVE THE VOTING DATE. Ms. Ferguson has gone beyond the appearance and have delved into the real concern that we should have – that in the next 30 years we will no longer own much of our public spaces. The Tri-island is small and we do not have unlimited resources. What will happen when they have been exhausted. Will we Grenadians no longer be able to afford to live here. Why do we need more office spaces? The town of St. George has numerous ‘for rent/sale’ signs. Businesses left a congested town to move to the South of the island. The coastline of Grenada will be blocked out by more buildings. Is it Grenada at a cost? Is that what we are selling? The postponement of the Panorama should not be allowed to go unchallenged! It is unacceptable to allow those in charge to simply float an alternative date post-haste. The Panorama Competition is a vital part of our Carnival activities and should not be held after Carnival is over. Let us hold the Carnival Committee responsible for this fiasco and ensure it never happens again.